May 29, 2017 – We’re uploading this episode for Memorial Day 2017, to pay tribute to the men and women who gave their lives in service to the United States. 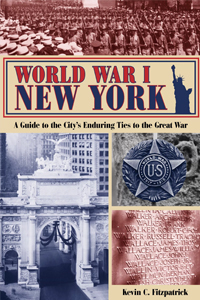 Leading us on this trip into the past, is Kevin C. Fitzpatrick, a licensed New York City Sightseeing Guide, United States Marine veteran, and author of World War I New York: A Guide to the City’s Enduring Ties to the Great War . World War I has deep roots in the Empire State, which sent more men to fight than the other stars on the flag. Next-door New Jersey played a big role, as well, including Dean’s hometown of Cresskill, which was home to the sprawling Camp Merritt. When those men shipped out, they rode the rail line to Hoboken, a prime embarkation point for the doughboys, leading to General Pershing’s slogan that they’d be in “Heaven, Hell or (back home in) Hoboken” by Christmas. The area remained an important hub for men, prisoners of war, and recruiting throughout the conflict. Following the Armistice in 1918, the city sought to remember those who lost their lives over there, and erected more memorials for this event than any other. To mark the centennial of the fight against the Central Powers, we’ll explore the legacy of the War to End All Wars, in 21st Century Gotham. You can find this week’s guest at FitzpatrickAuthor.com, or at K72ndSt on Twitter. His previous books including The Governors Island Explorer’s Guide and The Algonquin Round Table New York: A Historical Guide .